There was no other feasible option. To nurture and develop young ministers in mainland China, Pastor Alan had to carefully cross national borders with resources, tools, and insights. Though it wasn’t the safest route, it was safer than the alternative. As government restrictions have relaxed and international relationships have changed, God has presented the Church of God with an opportunity to better train and equip more Chinese pastors than ever before. Through Global Strategy’s Project Link, the Church of God is now in the early stages of making a Taiwan Mission Center a reality. For the first time in recent history, Chinese pastors will be able to gather in Taiwan to grow as Christ-centered leaders in Asia. 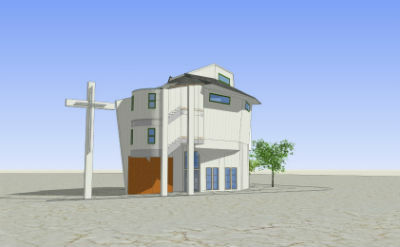 Once construction is complete, the urban Taiwan Mission Center will house up to twenty guests at a time. These emerging leaders will benefit from sound teaching and application on theology, church growth, Christian education, and Church of God history. Unlike typical minister training, Pastor Alan will take the strategy of the Taiwan Mission Center to an unusual, but highly practical, level. The facility will also be used for vocational training to equip pastors with the skills they need to minister bi-vocationally. Because Pastor Alan has a relationship with a coffee-grower and roaster, pastors will be trained to work as baristas. Besides the practical benefits of vocational training, imagine the outreach opportunities these pastors will have as they conduct day-to-day tasks outside of the traditional church setting! China makes up one-fifth of the world’s population. This new Taiwan Mission Center is expected to serve as a strategic hub for mission work in China. Those who know the history of Christianity and China know this is very good news. The project is sustainable, too. Not only will a church rent the facility for weekly worship services, but also the Church of God in Taiwan will continue to raise money for the project. The Church of God in the United States and Canada is urged to prayerfully consider donating to support this historic project (Project # 42.40463). Learn more about Project Link at www.chogglobal.org/projects/. This entry was posted in All Church of God, Global Strategy and tagged Asia-Pacific, Global Strategy, missions, Project Link, Taiwan. Bookmark the permalink.